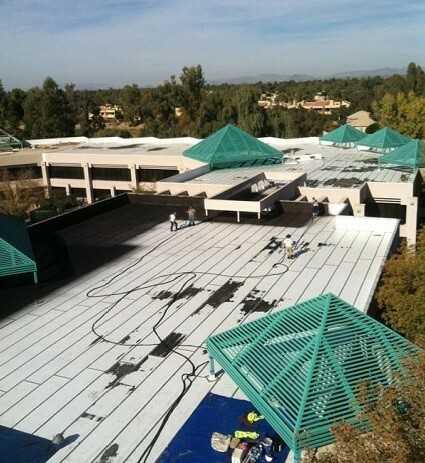 Flat roof repair with a seamless rubber membrane helped a client after a rare storm tore through Arizona with baseball sized hail severely damaging a two-year old roof on an insurance company’s office building in the prestigious Scottsdale business district. In order to prevent tearing off and starting over, the customer chose the durable TRITOflex rubber membrane recover system to go over top the existing roof. The client was presented with the two best options by the consultant. The first option was to do what they had done two years prior and tear-off the entire modified system down to the concrete decking and start all over. The second option was to have the roof recovered with the TRITOflex fluid-applied, instant-setting rubber membrane, which is hail-resistant, has no seams, and has the highest wind uplift rating in the industry. Rather than going through the cost, labor, and disruption of tearing off the entire roof system again, the client chose TRITOflex to be installed over the existing hail damaged membrane. The client achieved a new 15-year warranty and saved $500,000 over replacement cost. The TRITOflex two-component rubberized membrane was installed in one coat with a spray application directly over the existing modified bitumen roof system to achieve a 60 mil/1.5mm seamless membrane. It was then top coated with a thermal insulating surface coat to provide superior energy cost savings in the hot Arizona climate. With an industry-leading FM-approved impact and hail resistance classification, the flexible TRITOflex membrane will protect this building from anything mother nature may bring at it in the future.